The plan to get an early start got thrown out the window because the solar car trailer's rear left wheel had to be fixed. 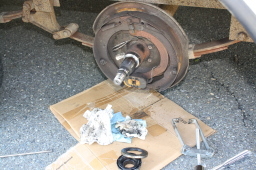 It required a new set of bearings. Well, at least it seems that was all it would require. Already running a bit late I didn't want to waste time getting help to get the trailer, just wanted to get it fixed and back on the road asap. Yesterday, Charlie Garlow (EPA / DC E.V.A.) 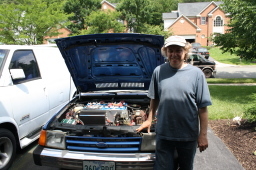 helped us find someone to work on the trailer - Chip an EV enthusiast. Jamie relayed the information over the phone and Chip got us all the parts we needed and was available to lend a hand. Before long I was at Chip's place. 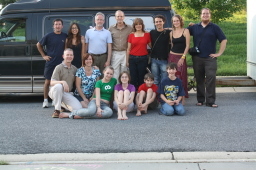 The first thing I noticed was an EV parked on the driveway that he built 16 years ago, the day his daugther was born. We got to work on it right away, between removing nuts and bolts we talked about our EV experience. Chip learned about XOF1 4 months before. After Marcelo returned from working on the trailor we decided that it would be best to charge the car before taking off to North Carolina where we needed to backtrack our trip. We parked xof1 in the Patterson's driveway for a few hours to charge and this gave their kids a chance to look at and learn about the car. Brian, one of the triplets, was excited about it and said that the solar car was going to be his car in 20 years for his school project. 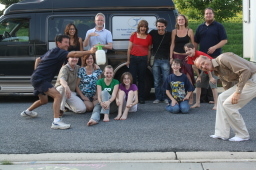 After taking photos, saying our goodbyes, and loading the car into the trailer, we left for DC to drop Valerio off at Margerite's house. It's always sad to see another crew member go. Then we were off to North Carolina. We had a long drive ahead of us and didn't get to our destination in Wilmington N.C. till about 7:30 in the morning. 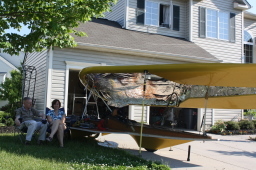 The solar car team woke up Don’s today with a somewhat slow start. Marcelo went to get the trailer first thing in the morning. Due to a foot injury that I acquired while walking in the Everglades, I had to take care of my foot. I was also sick, so I took some medicine that Laurie got for me. When Marcelo returned, he presented the XOF1 to Don’s family and some neighborhood children. With the trailer prepped, the solar car packed up, and the team well rested, the solar fellowship drove all night towards Wilmington, NC. On the way, we dropped off Valerio to stay with our new friend Marguerite. I will very much miss Valerio. 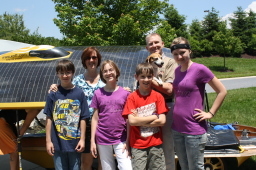 He was a fantastic saxophone player, a smart engineer, and an invaluable asset to the solar car team. Perhaps I will see him and Michael in the Netherlands someday. Jim wakes up early, with a start (I think, “His medicine must have worn off?”) He jostles me awake, saying, “Hey, we are making everyone Swedish Pancakes today, better get up and get cracking!” I think very sleepily to myself, “I must be making the Swedish Pancakes since he obviously can’t use his right hand!” But, I keep quiet about it and rouse myself up at a very early hour. I whisper, “Why do we have to get up so early, everyone wants to sleep in a little, don’t they?” Jim whispers back, “Because you have to go to the store and get all the ingredients right now, and because we need to get our showers first so we can make breakfast for everyone else.” Oh, darn, I guess I won’t be sleeping in today! I get up and Don and Iris are up, so I ask Don for directions to the nearest store. I sleepily try to memorize them; the streets are pure Emerson’s poetry, “Fall Rain Drive,” “Midsummer Snow Road,” “Sea Valley Way,” etc. Don sees my memory being taxed and agrees to go along with me; terrific, I would love some company to the store! It is so much fun to drive the convertible! Wow, what a thrill! On the way, Don and I talk about the challenges of parenting; I tell him it is much harder than anything else I have ever done in my life, like commercially fishing in the cold, deep, Alaskan waters for salmon, or working the 7 extra years of college to get a Ph.D. Don is very sympathetic; he has to work twice as hard as me since he has twice the kids! We have a lot of fun tooling around the grocery store gathering up the items I think I will need; I’ve got to have yogurt, but I want Organic Stonyfield Farms, he wants Activa because his kids like it, so we get both! I have to have cottage cheese, fresh strawberries, canned peaches and pears, although I regret not having the home canned Organic ones we have in Wenatchee, I know these won’t be as good! I also have to have honey and peanut butter, but Emma Patterson is allergic to peanuts and has to avoid them, so we opt not to buy any and hope he has enough at home. (He doesn’t!) On the way home from the store, I reflect that going on tour with the solar car is one of the most genuinely exciting and rewarding things I have ever done in my life; fishing for salmon in Alaska was at times very breathtaking and exciting; but I must admit that the feeling I get in retrospect is not so good, it is still harvesting wildlife from the gorgeous ocean, not nearly as good a feeling as promoting clean, sustainable, natural energy that is free from the sun every day! I feel a little sad to be leaving the tour after so short a time, it is hard to explain to someone who has never experienced it; this is my third time, but the shortest and probably the hardest because I am not sure I will ever get to return on tour again. Erin is game and likes her pancakes, too. The triplets are all eventually convinced they must try them and seem to like them, too! Mark and Josh are next, then Jamie and I have one, Marcelo comes up but I don’t see him eat one or even notice that there is food available. I marvel to myself that he doesn’t seem to care about food very much, unless it is brownies! Shortly after this, I see him drive away the van and trailer, I am astonished! Valerio and Laura are the very last to arise, they eventually have a Swedish pancake. Josh and I learn that Marcelo is getting the wheel on the trailer fixed and we don’t know when he will return, so we put up all the rest of the Swedish Pancakes and clean the dishes for the Patterson’s. They have been such terrific hosts and put up with so many of us for so long and have been so understanding and patient with all the chaos and our crazy solar car schedules! The crew members all do assorted things; Josh soaks his aching feet, the rest of the crew take turns getting showers. Marcelo gets back about 11 AM and we get to work right away at setting up the solar array to charge, of course! The car is charging and people come by to see it from the neighborhood, plus the Patterson kids finally get a good look at it and we get some good pictures of them, including Molly, of course! 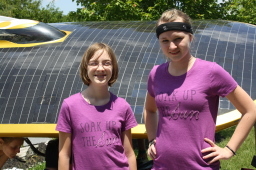 Emma and Erin have a wonderful shirt that says, “Soak up the Sun!” So appropriate for the solar car and we take their pictures with the shirts on, of course! I tell Marcelo that they would make great t-shirts for his female crew members and Marcelo agrees, telling me, “I like purple!” I like purple, too and make a mental note to go straight to Old Navy when I get home to see if I can get a shirt like that for myself, or maybe the solar car crew? 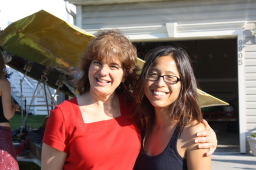 Jim also takes some very darling pictures of model beautiful Erin and the Barbie Blue Mustang, juxtapositioned in front of the XOF1 solar car. Around this time, Jim admits to me that he overdid it with the breakfast making and wants to have his finger looked at by a doctor. He doesn’t trust me to change the dressing and I am okay with that, I can understand his reluctance. I am not sure I got good enough instructions at the Washington, DC ER, so we head to a Maryland weekend clinic for a couple of hours where we get better instructions. The wonderful doctor says the finger is fine, Jim shouldn’t be doing so much with it! I am a little sad to miss out on seeing Marcelo and crew yet again, Marcelo promises me he won’t leave while we are gone and as usual, fulfills his promises. Don and Iris go buy lunch for the solar car crew when we are gone; vegetarian beans, hummus, potato salad and the fixin's are for Hoagie sandwiches, yum yum! Of course, I miss lunch for the third day in a row, because of being at the clinic with Jim! 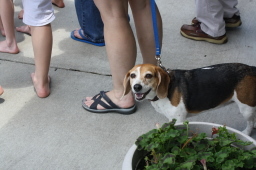 When we return, a few of us rest in the shade of the solar array, some have ice cream, we all socialize a bit with each other here and there, and some work on their laptops down in the basement. I try not to be sad about Marcelo and the crew leaving today. I am not sure I even spent enough time on the crew this time to be considered a “real” crew member. It’s an uncomfortable feeling and I don’t like it. I have to give myself a pep talk to get over it, Marcelo won’t like it if he finds out I am sad, I have learned that much about him! 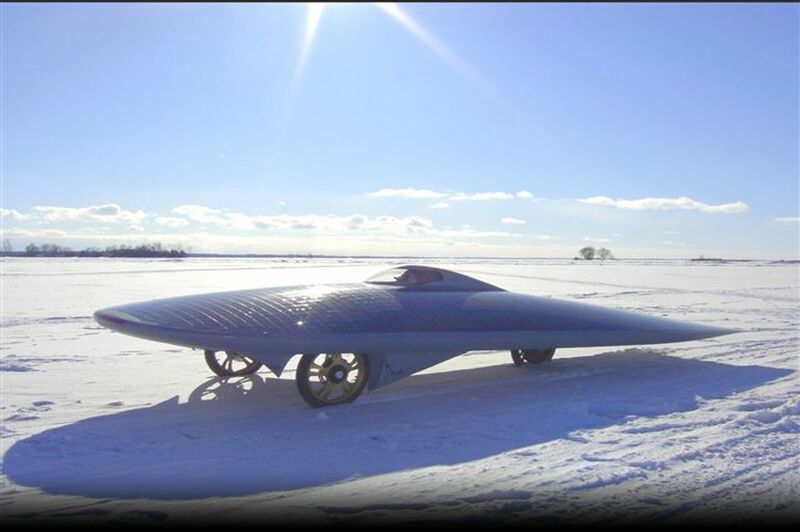 If the weather had cooperated, we would have had more than one more complete day to spend with the solar car and crew, we had always planned to go on the road with them and film the solar car from the back of the Barbie Blue Mustang convertible! As the afternoon wears on, Jim and Don decide to go to the store to buy dinner. 3rd time someone (Don) went to the store today, unbelievable! They decide to buy some Pacific (wild) salmon for the Patterson’s to try. They haven’t had it and we are salmon snobs, we won’t eat farmed salmon and most salmon from the Atlantic Ocean is farmed! Mark is a piscetarian and fish is the only meat he will eat, we don’t think that Marcelo and the mostly vegetarian crew will be there for dinner, so it is a safe entr�e. Marcelo decides it is time to pack up the solar car, where is the solar car crew? Mark single handedly moves most of the stuff out of the Patterson’s garage over to the trailer and I join him in the endeavor. We get it almost done and I tell Mark, “Now you are a member of the solar car crew!” Jamie comes out then and helps, too and soon the whole crew is aware that the solar car is going back into the trailer and they get busy getting it inside, I take some pictures this time. Marcelo and crew get everything packed up and are ready to go. Valerio is leaving the crew tonight and Marcelo is also losing Jim, I and Mark. The crew is going down from a high of 7 to 3 in one fell swoop! We take a big group shot of all 14 of us and I am proud of myself for predicting that Marcelo is up to no good when he leaves the shot by asking for the keys to the trailer, a water fight ensues! Watch out for sneaky Marcelo! The Patterson kids love it and Marcelo says “Uncle” to them when they go inside and get out these humongous water machine guns, Wow! We all say goodbye to the wonderful, wild and wacky solar car crew and their intrepid, tenacious leader, Marcelo da Luz. Marcelo gives me a long hug, and I am very happy I don’t cry when they leave, it is so hard to not go with them! Goodbye, good luck, and may the Sun Goddess always shine wherever you go! offered by the stars. Worshiping the sun is a practice we are not far from with sun salutations as our preferred method of thanks and praise. Outside the array is set up and we are charging at 5.8 AH. After spraying the cells with distilled water the input is increased to 7.3AH! Instantly the efficiency is increased and the cells are happily enjoying the cooler temperature the water affords them. Using an infrared thermometer we measure the difference between the surface of the car where the cells are and the inside where Marcelo spends his days in a compact mylar insulated isolation traversing the roads of North America. Top of car- 155*F, inside car- 85*F...a 70* difference! We also test the top of head temperature difference between blondes and brunettes. The darker the hair, the hotter the head, by an average of 7*F! Maybe blondes are dumb because we operate at colder temperatures? Maybe not because cooler means more efficient: with every 4*increase in temperature, the solar cell efficiency decreases by 1%! While waiting for the car to fully charge we lounge around in the basement listening to music, writing updates and my mind goes warp speed with solar possibilities- a solar electric scooter, a solar helmet and a solar suit to wear on the bike, solex solar powered watches, a solar bathing suit simultaneously soaking up the sun and powering an ipod too. 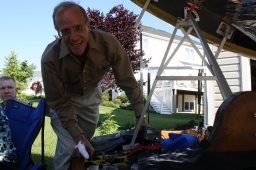 Solar blankets, tarps and tents, and a solar thermal jacket for the arctic. What about photovoltaic fabric? How fragile are the cells? Is it soft, formable, rollable and wearable? the belly-button of the earth being a convergence point for all human experience and emotion, all of the provinces of all the nations uniting for peace- l’ombilico del mondo!!! lullabies of ambient tunes. When we stop for gas I take a back seat and fall easily into slumber within minutes. Emma and Erin, wearing a cool t-shirt "soaking up the sun"
Marcelo, explaining some of the details of the array / MPPT (Maximum Power Point Tracker) box to the iwtalkiing to the crew about the. Brian doing his school work about 20 years into the future, he plans on driving a solar car! 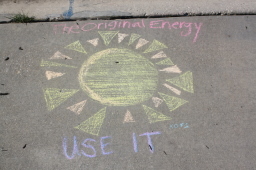 Erin's creative message "the sun, orininal energy, USE IT"
Laurie and Jamie, happy to finally meet in person! Jamie and Laura busy at work, helping take the solar array down. Hey, where are the boys? 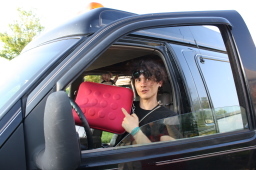 Every one say "solar car"
Valerio's last time driving the car, showing his "pink" computer case. Really, its pink!